Sessions are 7 hours long with an hour off for lunch. Sessions are available 6 days a week, starting at 9 or 10am. The shop will do it's best to accommodate your schedule. The print shop provides all project materials except editioning paper and outside fees for service, such as films or shipping. Please remember to bring your own brushes. You can bring your own paper or buy from our collection. - 2 Platen Presses, press bed 21" x 15" and 8" x 12"
Price of sessions on request. 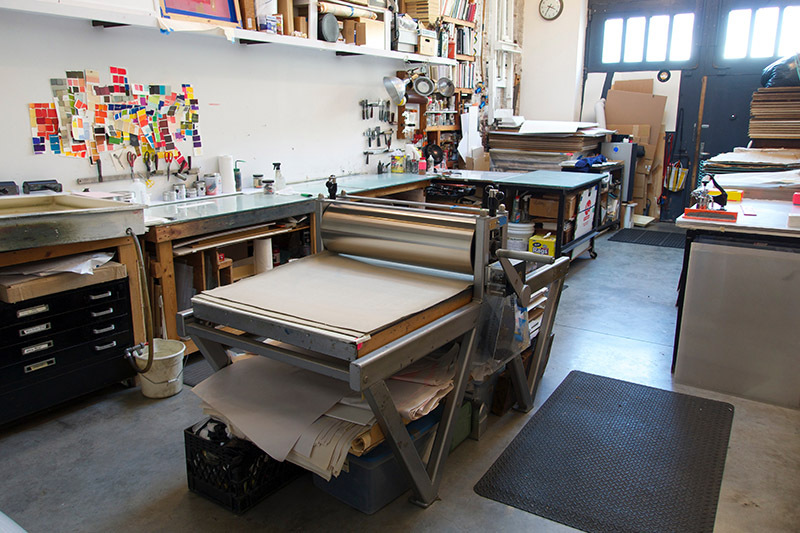 Drop off your originals and the master printer will execute the project for $75 per hour. Workshops are available seasonally for adults and children. Contact us for more information. We can special order paper for you to be delivered to the studio before your session, just let us know. Payment in full is appreciated at the end of your work day. We accept check, quickpay, or cash. Please give two weeks notice. A $100 fine will be charged for cancellations less than two weeks. This covers the reserved studio time. You may use the studio kitchen to prepare lunch or keep your food fresh in the refrigerator. Feel free to bring your own music for printing inspiration.